So what does one do with all of those tomatoes? While I have extolled the simplicity of making and canning tomato sauce – especially with the right kitchen tools – there’s only so much tomato sauce a girl needs to get through the winter. Heck, I still have a case of tomato sauce left over from last year! With more tomatoes than I knew what to do with, I started broadening my tomato preservation horizons this year. First, I canned tomato juice, which is even easier than canning sauce because the sauce-making step is eliminated. Next, I made and canned Brandywine chutney. (Brandywine is an heirloom tomato variety that produces large, super sweet fruit.) That process was pretty labor intensive, but entirely worth it. The result was an awesome homemade alternative to ketchup, which I can see myself making again and again in the years to come. Finally, with two more five-gallon buckets of tomatoes staring me in the face, I decided to can crushed tomatoes. Crushed – or quartered – tomatoes are a great product to have on hand to use in chili, stews, and casseroles when you want more tomato texture than what you get from sauce. But it takes a bit of doing to separate the flesh of the tomato from the bits you don’t want – the skin and the seeds. I knew I would have my work cut out for me. I cleared the calendar and took the afternoon off from work. 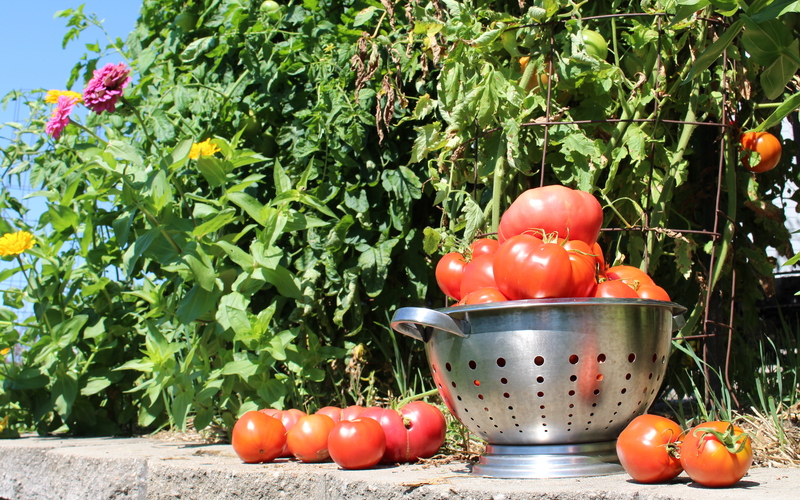 I labored for hours – washing, peeling, coring, seeding, chopping, and crushing tomatoes. And that was before even getting to the part about packing them into hot jars and processing them in a hot water bath. In the end, I was rewarded for my efforts with six quarts of crushed tomatoes. Six quarts?! All that work for six quarts? I may think it was worth my effort this coming winter when I have those lovely crushed tomatoes to make homemade chili or a chunky tomato soup. But when it comes time to do something with that last bucket of tomatoes (which will be pretty much when I get done writing this blog post! ), I think I’ll stick with tomato sauce. If you think you are up to the challenge of canning your own crushed tomatoes, here’s my step-by-step guide on how to can crushed tomatoes in an afternoon. See my affiliate links below to purchase some of these items from Amazon.com (and make sure to check out my full affiliate disclosure at the bottom of the page). 2. Clear your calendar and take the afternoon off work: As soon as you get home, run the case of canning jars through the dishwasher. Fill both the water-bath canner and the second large pot about two-thirds full with water and put them on the stove on low heat. Then go change your clothes and make yourself some lunch. 3. Pour a glass of wine (or adult beverage of your choice): You’re on vacation, right? And, while you’re at it, crank up the tunes. It’s going to be a long afternoon. 4. Okay, it’s time to get to it: Turn up the heat under your second pot of water (leave the water-bath canner on low heat for now). You will use this water for blanching and peeling the tomatoes. 5. 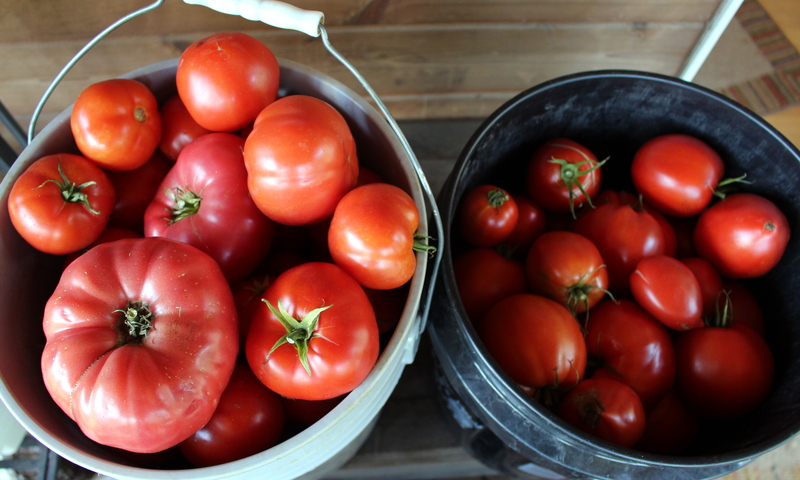 Prepare the tomatoes: Select and wash 18 to 20 pounds of tomatoes. A paste variety like Amish Paste (my favorite) works best because of its meaty, juicy flesh and fewer seeds, but don’t stress about variety – the point is to use what you have. For best results, use fully ripe tomatoes with no soft spots. 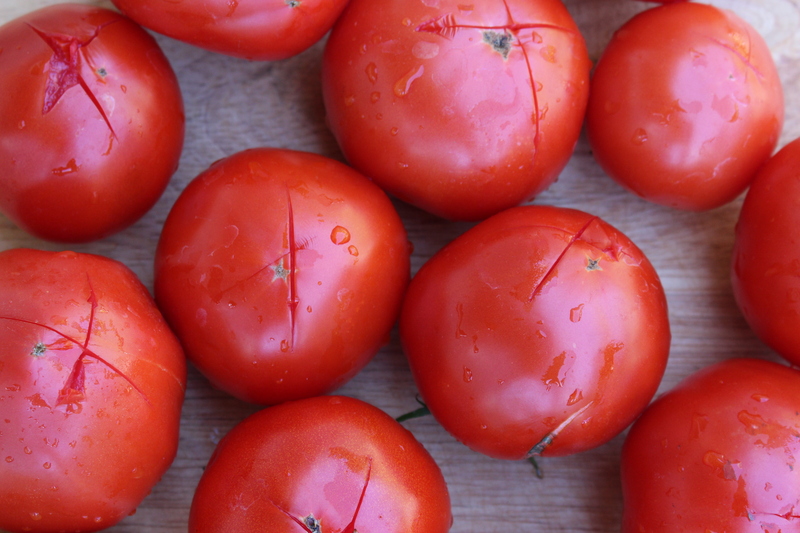 Wash the tomatoes, remove the stems, and trim off any blemishes. Using the paring knife, make a small, shallow X in the bottom of the tomato. 6. 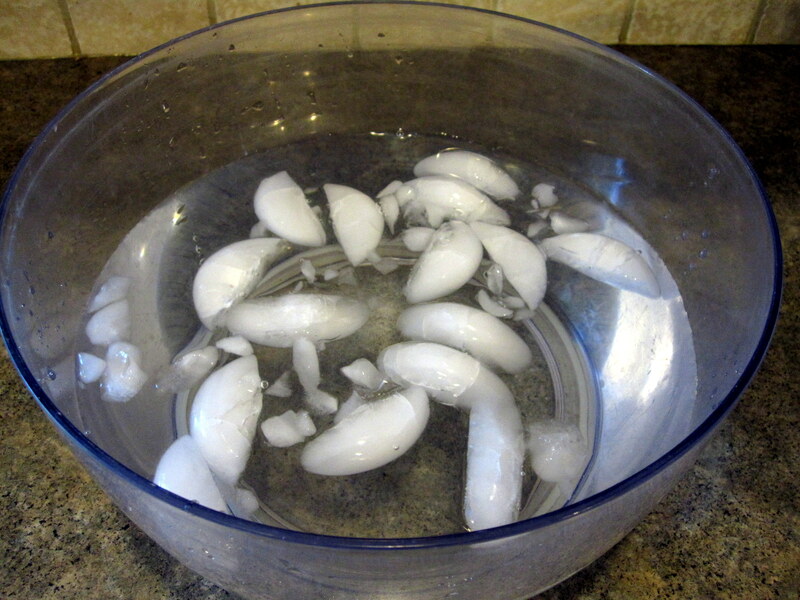 Prepare an ice water bath: Fill the large bowl with cold water and ice. You will use this ice water bath to quickly stop the cooking process after you blanch the tomatoes, so it’s important to have it ready before proceeding with Step 7. 7. Blanch and peel the tomatoes: Once the water in the pot has come to a boil, and working in batches of 4-5 pounds of tomatoes at a time, gently place the tomatoes into the boiling water. Boil the tomatoes for 30 to 40 seconds or until the X begins to split open. Use the slotted spoon to remove the tomatoes from the boiling water and place them directly into the ice water bath to immediately stop the cooking process. Once they are cool enough to handle, remove the tomatoes from the bowl and peel the skin by pulling it back gently from the X. The skin should slide off easily. Discard the skin, or add it to your compost pile. Return the water in the pot to a boil and add more ice to the ice water bath as necessary between batches. 8. Seed the tomatoes: Place the sieve on top of the small bowl. Quarter each tomato, trim out the white core, and gently squeeze the tomato quarters over the sieve to expel the seeds from the seed cavities, using a spoon or your fingers as necessary to dislodge any seeds that adhere to the tomato. Discard the seeds that collect in the sieve. 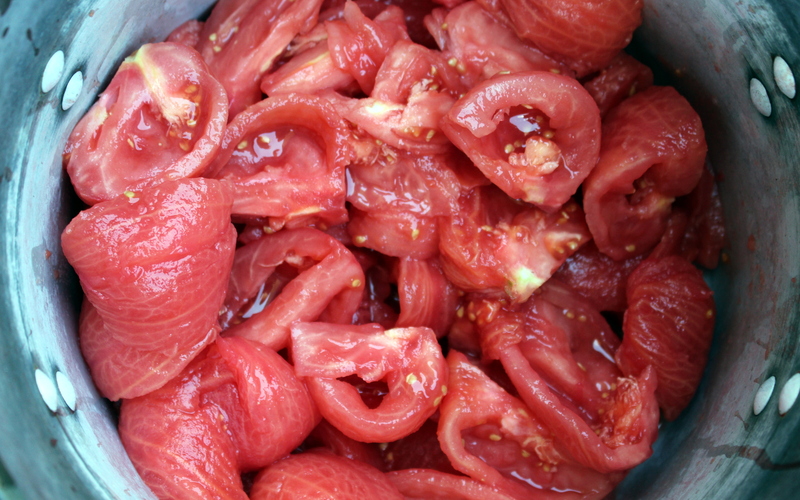 Save the accumulated juices that drain into the bowl to add back into the tomatoes before canning. 9. Prepare the hot water bath and jars: By now, the dishwasher cycle should be complete. Place the jars right side up in the water-bath canner, making sure to fill each jar with hot water. (Make sure none of the jars have any cracks or nicks.) Bring the water to a boil while you proceed with Step 10. Also get some water boiling in the tea kettle in case you need extra boiling water for processing the tomatoes (see Step 13). 10. 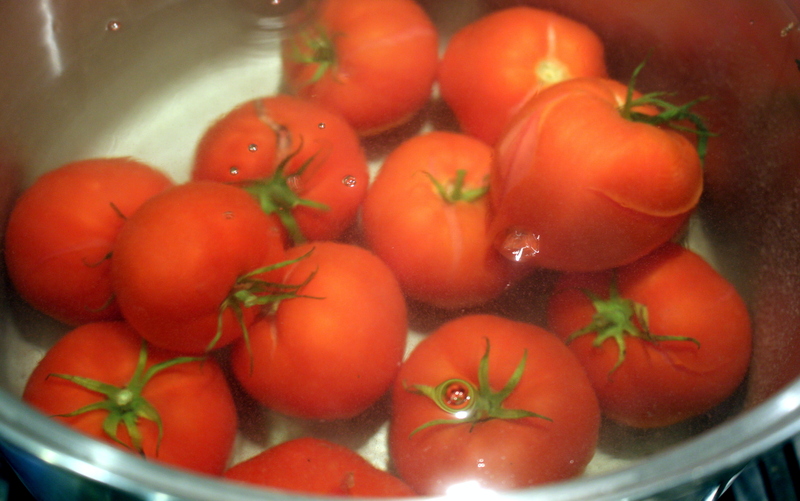 Heat the tomatoes and accumulated juices: Empty the remaining water from the large pot you used to blanch the tomatoes. Add one-quarter of the tomatoes to the pot and heat over medium heat as you crush the tomatoes with a wooden spoon to exude the juice. 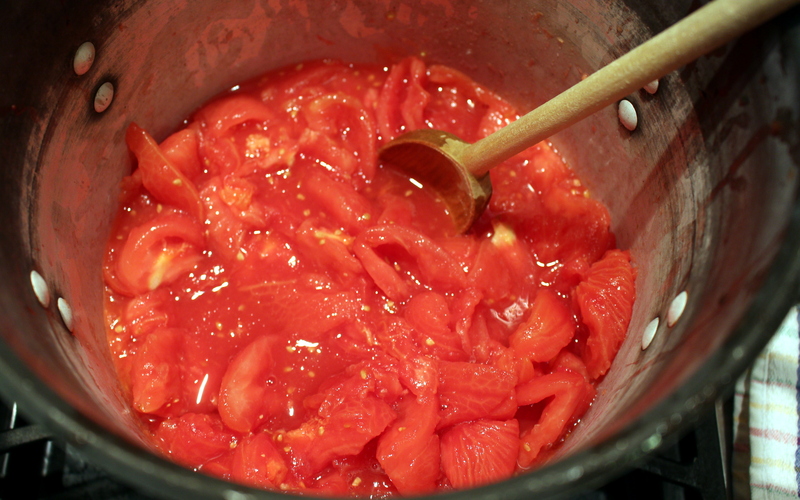 Gradually add the remaining tomatoes and reserved juices, stirring constantly, as you heat the tomatoes to boiling. Boil for five minutes. 11. Prepare the lids and screw bands. Put those five minutes while the tomatoes are boiling to good use by preparing the lids and screw bands for processing. First, inspect the lids to ensure that (1) the sealant on the underside of the lid is even; and (2) there are no scratches or dents. Note: You should only use new lids. NEVER reuse canning lids because they will not seal properly. Screw bands may be reused as long as they are not bent or rusted. Wash the lids and screw bands in hot, soapy water, and rinse well. Submerge the clean and rinsed lids in hot (not boiling) water until you are ready to use them. Release any air bubbles in the jar by running the thin spatula all around the inside of the jar while pressing gently on the tomatoes. Wipe the jar rims with a clean, damp cloth to remove any food particles that may interfere with the seal. Using the magnetic lid wand to avoid touching the lid, remove a clean lid from the hot water and place it on the jar, sealant side down. Then fit the screw band over the lid and hand-tighten the band. Don’t overtighten the band, as overtightening may cause jar breakage during processing. 13. Process the jars. Load the filled and closed jars into the canner, using a canning rack or jar lifter. The jars should not touch one another to prevent breakage, which means you should process no more than seven quart jars at a time. If necessary, add additional boiling water from the tea kettle so the water is at least one inch over the top of the jars. Turn up the heat until the water reaches boiling. Once the water reaches boiling, set a timer for 45 minutes for quarts (35 minutes for pints). Note: Altitudes above 1,000 feet will require additional processing time. The water must maintain a gentle boil for the entire processing time. 14. Cool the jars. At the end of the processing time, turn off the heat and use a jar lifter to remove the jars from the water. Place them on a clean towel out of any drafts, leaving at least one inch of space between jars. 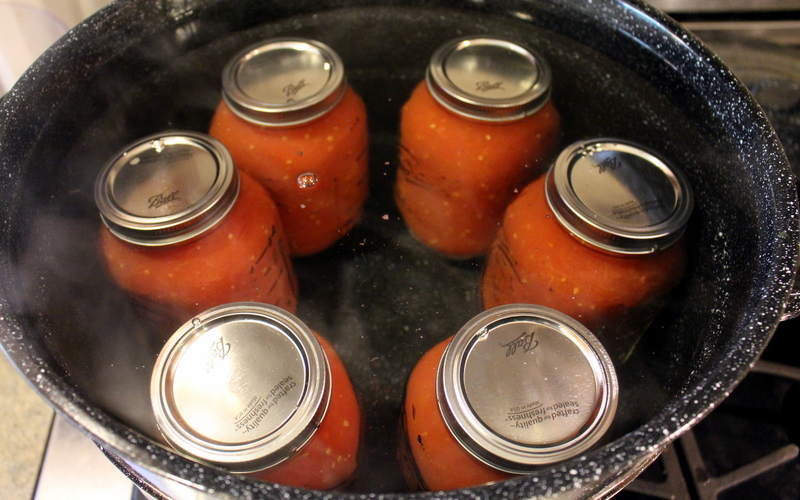 Do not touch the bands or lids until the jars have cooled completely, which may take 12 to 24 hours. As the jars cool, you will hear popping noises as each jar produces an airtight vacuum seal. 15. Store the jars. Once the jars have cooled completely, test the seals by gently pushing on the center of the lid. The lid should feel solid and should not depress or make a popping noise. If a jar has not sealed properly, store it in the refrigerator and use within two weeks. For jars with proper seals, remove the screw bands, label with the date processed, and store in a cool, dry, and dark place. 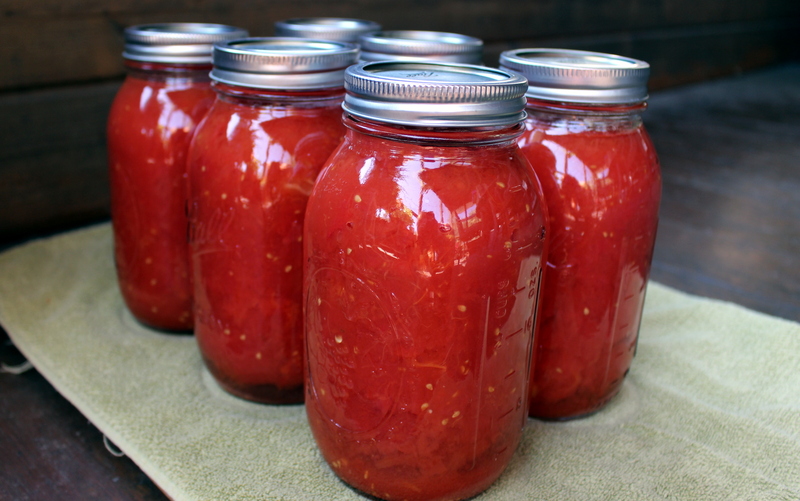 This entry was posted in Preserving the Harvest and tagged canning, canning tomatoes, crushed tomatoes, food preservation, water bath canning by Deborah Neyens. Bookmark the permalink.